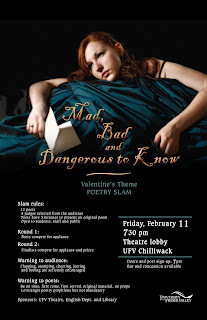 Poetry Slam, Feb. 11: "Mad, Bad, and Dangerous to Know"
Join us for "Mad, Bad and Dangerous to Know," our 3rd annual Poetry Slam on Friday, February 11, in the UFV Chilliwack campus theatre lobby. As in our previous "Love Hurts" events, poets register immediately prior to the performance and have three minutes to present an original poem. Judges are randomly selected from the audience. In round one, poets compete for applause. In round two, finalists present a second poem and compete for cash and prizes. There are no props, musical instruments or fireworks. Love or angst poetry is suggested but not mandatory. Poems can be about any topic. Doors open and poets register in the theatre lobby at 7 p.m. on Friday, Feb. 11. The slamming starts at 7:30 p.m. Bar and concession available. For more information, call 604- 792-0025, local 2471. Sponsored by UFV Theatre, English department, and Library. Food for Fines Success - Thanks! During December, the UFV Library ran its traditional Food for Fines campaign. Library overdue fines were forgiven in exchange for donations of non-perishable food. Each donated food item was worth the equivalent of $2.00 towards overdue fines, to a maximum of $20.00 per person. As usual, the UFV community showed its generosity, and our local food bank users benefited. Between the campuses, 481 items were donated in exchange for the forgiving of $962 in fines. An additional $20 cash and 148 items were also collected. Thanks to all who contributed and made the holiday season brighter for our local food bank users. Let us know what you think of these changes. Did they address your concerns? Have they made it easier to find your way around? If not, what suggestions do you have? Nature is now available as an online journal. This international weekly journal of science is the most highly cited interdisciplinary science journal, and publishes peer-reviewed research articles as well as cutting edge news stories. 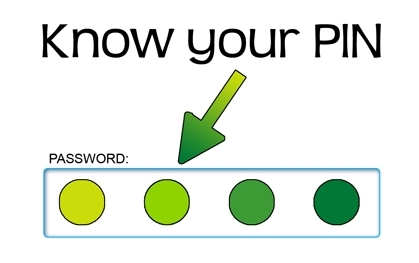 The online site provides such features as e-alerts, RSS feeds, video and podcats, and expanded supplemental material. UFV's subscription allows for access to a 5 year backfile. Counseling and Therapy in Video is a collection of hundreds of online videos used for the study of social work, psychotherapy, psychology, and psychiatric counseling. Videos include actual and re-enacted counseling sessions, lectures, interviews and presentations by well-known therapists, and teaching and discussion guides.